So after a long 6 months, Le Poteau has two bosses. Fiona has arrived. Yes, sharp intake of breath from those of you who know us well, we are both in charge! No blown gaskets yet although I did manage to blow a fuse this morning. Literally! No electrics for 15 mins until I managed to fix things. The general calm has been helped by the fact that it turns out that my wife does actually work quite hard. Maybe all that moaning about Head Teachers’ workload wasn’t too exaggerated. She hasn’t even managed a hammock moment yet. She has become a bit obsessed with finding uses for our considerable crop of plums. So we’re not driving over lemons just squelching over the odd plum. 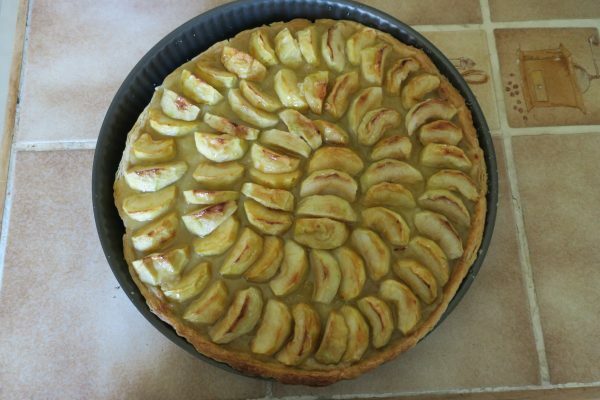 Any ideas for how to use up windfall plums? Her last few weeks at work appear to have been littered with leaving dos. All fabulous she assures me. Fellow heads and colleagues across North Tyneside were incredibly kind and supportive. This comment has, of course, absolutely nothing to do with the fact that some of them may be following this blog. Quote 2 from my wife “They were all amazing,especially the ones who might come and visit Le Poteau.” However, the star award has to go the the great people who make up the community from Fiona’s old school Balliol Primary; children, staff, parents and governors. They know how to send someone off in style. According to Fiona, they pitched it all just perfectly, although possibly her favourite memory is her final scooter ride at the end of her leaving assembly. Quote 3 “I may not be remembered for much but I will almost certainly be remembered for nearly crashing a scooter into the back wall of the assembly hall.” As one of her gifts she got a beautiful photo book with some amazing un-posed shots and really lovely comments from the children. A great souvenir of a special place. So there we are, as one career ends another begins. She moves on from prioritising children to sorting out a wild donkey and from managing cleaners to donning the rubber gloves herself. Things are really starting to come together here. 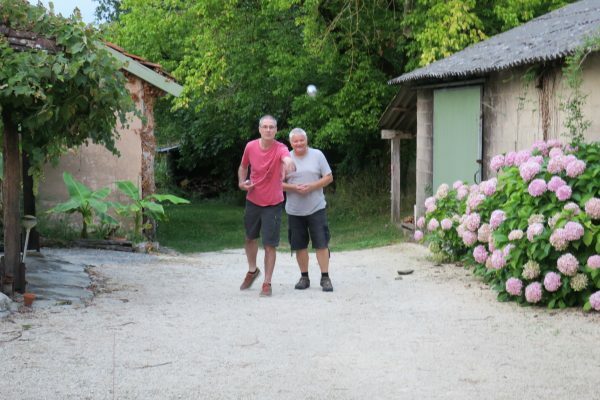 The gites are finally finished and we are really proud of them. Guests so far have been really positive and have particularly commented on how relaxed they have felt during their stay. 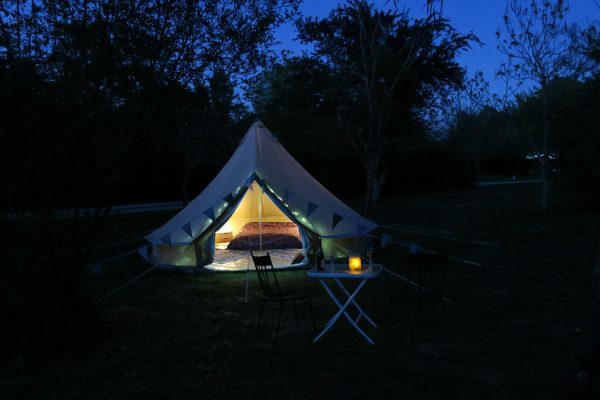 Les and Carolyn were our first guests in the bell tent. Les and Carolyn were lovely. I think Les, who is a contractor, was just itching to get his hands on some kit and drain some of our unused fields. Maybe next time ! 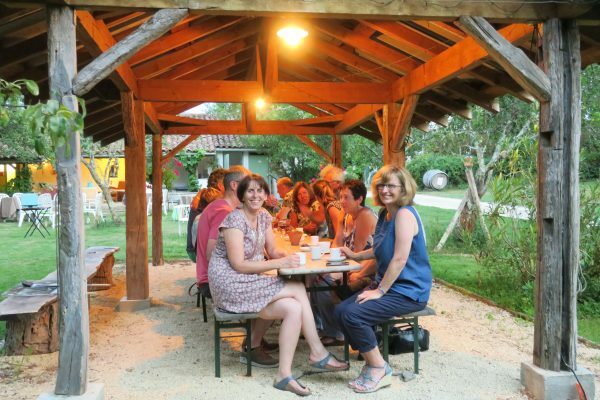 They joined us for our first Table D’hôte dinner in the orchard, along with some of our happy campers and Joop and Marijke (Le Poteau’s previous owners). It was a great success and I really enjoyed getting to cook with local produce and fruit from our own trees. LIke many, Fiona did her stint of pub work during school and student years and despite the considerable lapse of time, the skills came flooding back. Our guests particularly enjoyed coming together to chat and either refresh old friendships or build new relationships. 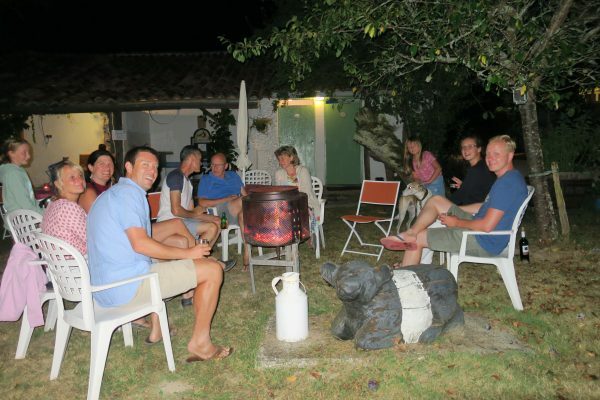 We’re so pleased that so many longstanding clients have returned to Le Poteau. Some have been regulars for 15 years so know the site and area better than us. Ton and Pierre, in particular, are a fund of knowledge and so kind and supportive. We’ve been delighted to welcome new customers who have checked in for a night but stayed longer and have left promising to tell their friends about our beautiful, peaceful site. We’re also now on Trip Advisor and have a 5 star average (only one review in Dutch so far but hopefully many more to come.) Our first Airbnb clients also wrote a fabulous review in Spanish. We ran them both through Google Translate as our linguistic skills don’t quite run to that and were delighted. The local area continues to be full of surprises. Last weekend Castelnau was en fête. There were meals by the lake, music and an antiques market. This week it is Gabbaret. There are events in Castelnau, Eauze, Condom and Montreal throughout the summer months. 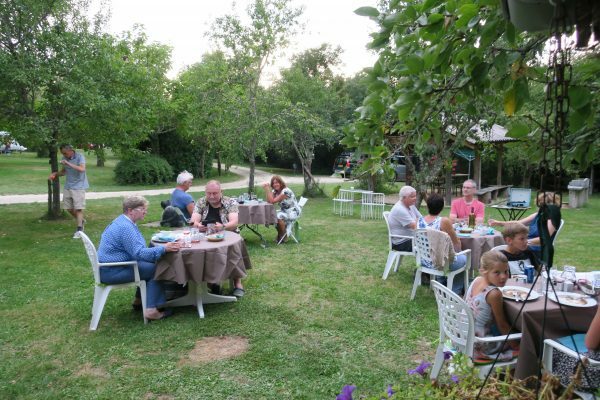 Just one hour away, the famous Marciac Jazz Festival has now begun and there is a Jazz/Swing evening on the lake here in Castelnau d’Auzan later this month. Entertainment inside Le Poteau, however, is a bit more sedate, although things started to heat up a bit as our guests’ competitive nature comes out during the pentanque games. The weather has become more sensible after a short, relatively unusual, heat wave It has been warm and at times hot but it is lovely and cool in the shade and there are plenty of shady spots around Le Poteau. One huge bonus is a lack of flying biting things. We can’t swear that there are none but they are certainly not a problem. The main risk from above is an apple or plum falling on you if you choose to chill under one of our fruit trees. Top tip; plums do less damage than apples. 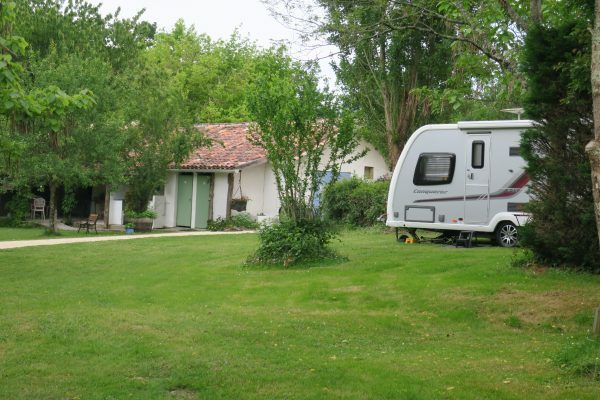 This entry was posted in Campsite, Le Poteau, Uncategorised. Bookmark the permalink. Le Poteau Rocks! Comments Off on Le Poteau Rocks! Here comes the sun….. Comments Off on Here comes the sun…..